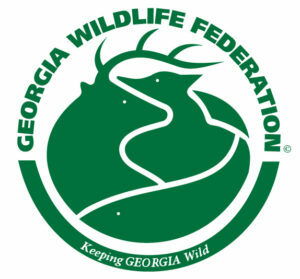 The Georgia Outdoor Stewardship Coalition is comprised of The Conservation Fund, The Georgia Conservancy, Georgia Wildlife Federation, The Nature Conservancy, Park Pride, and The Trust for Public Land. GWF President, Mike Worley, and GWF Treasuer, Don Chandler, were both in attendance at the signing. 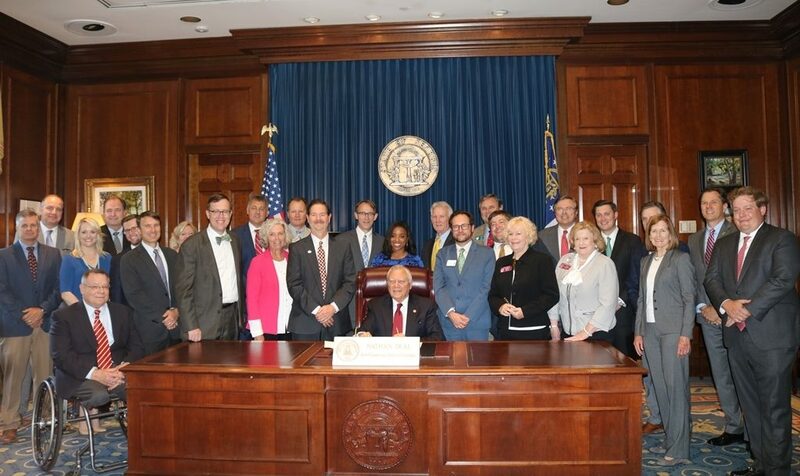 Governor Nathan Deal signed the Georgia Outdoor Stewardship Act (HB 332) into law in a ceremony at the State Capitol on Monday, May 7. As a result, voters will have the opportunity on the November General Election ballot to dedicate a portion of the existing sales tax on outdoor recreation equipment to the conservation of waters, lands and wildlife. The bill was passed overwhelmingly by both the State Senate and State House of Representatives during the 2018 legislative session. “This bill received strong, bipartisan support and has been signed into law because of the positive impact it could have on communities throughout our state without creating any new fees or raising any taxes. If the voters agree, this funding will be used to protect invaluable natural resources while ensuring that that children, families and outdoor enthusiasts have parks, wildlife management areas and other outdoor spaces to enjoy for generations to come,” said Representative Sam Watson of Moultrie, the bill’s primary sponsor. If passed by voters in November, the Georgia Outdoor Stewardship Act would provide for the dedication of up to 80% of the existing sales and use tax on outdoor sporting goods as classified by the North American Industry Classification System (NAICS), with an initial dedicated amount of approximately $20 million annually. The legislation would sunset after ten years, with the option to be renewed. Funding dedicated through the Georgia Outdoor Stewardship Act would be used to protect clean drinking water supplies and wildlife habitats, acquire and improve parks and trails, and protect and maintain wildlife management areas and state parks. Only projects approved by the Department of Natural Resources and consistent with the state’s established goals for conservation would be eligible for the funding, which will be subject to strict accountability provisions. “We are grateful to Governor Deal for signing this legislation and to our legislative leaders for their support of this historic opportunity for conservation in our state. We are hopeful that voters will agree that our outdoor spaces are a worthy investment of existing tax dollars and look forward to earning their support in the months ahead,” added Thomas Farmer, executive director of the Georgia Outdoor Stewardship Coalition and Senior Policy Advisor for The Nature Conservancy in Georgia. A recent poll commissioned by the Georgia Outdoor Stewardship Coalition indicated that eight in 10 Georgians agree that a portion of the existing state sales tax on outdoor recreation equipment should be constitutionally dedicated to land conservation. The coalition, which led the effort to pass House Bill 332 and its companion resolution, HR 238, is comprised of The Conservation Fund, The Georgia Conservancy, Georgia Wildlife Federation, The Nature Conservancy, Park Pride, and the Trust for Public Land. Reposted from the the Georgia Outdoors Stewardship Act website.